Almond Tangerine Butter Cookies. Sweet and slightly tangy with a smooth citrus finish. Almond extract and tangerine zest. Cornmeal adds a slight crunch. This is a beloved and whole-hearted recipe post that’s part of a Cookies for Kids with Cancer and The Great Food Blogger Cookie Swap campaign. This selfless, wonderful organization is allowing food bloggers to do what they love (sharing food) while making an actual difference in the lives of others. I’m truly honored to be writing this. In a nutshell, bloggers donate a small amount of money, that is then matched by the organization, and donated towards helping kids with cancer. The cookie part adds a bit of fun. It’s a Secret Santa of sorts for cookie swapping. I was given the names and addresses of three food bloggers. I baked 3 dozen of these Almond Tangerine Butter Cookies, and shipped a dozen to each of them. They didn’t know who they would get the cookies from, or when, and the same goes for me. I got three dozen, hand made with love, cookies in return. Ahh, my heart just warms up. This is what the holidays and being a food blogger is really about; helping and sharing with others. I’m not sure exactly what constitutes an official Christmas cookie recipe. Does it need to have something red or green in it? Or be gingerbread? How about peppermint? (See my recent Spiced Hot Chocolate Peppermint recipe for an indisputable holiday cookie recipe). In my mind, it’s anything you can enjoy and would want to share with those important to you this holiday season. 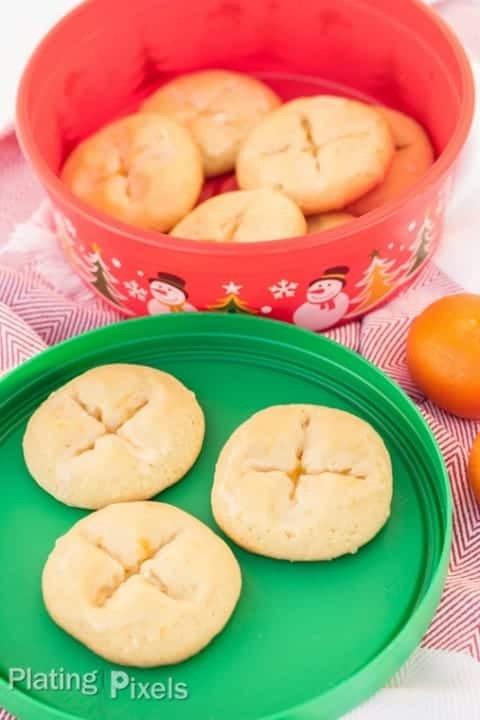 Please share these Almond Tangerine Butter Cookies and bring a little bit of extra joy to someone’s world. They’re sweet, and slightly tangy with a smooth citrus finish. Almond extract and fresh tangerine zest are the main stars of this recipe. However, there’s a unique addition as well; cornmeal adds a slight crunch that lingers after every bite. 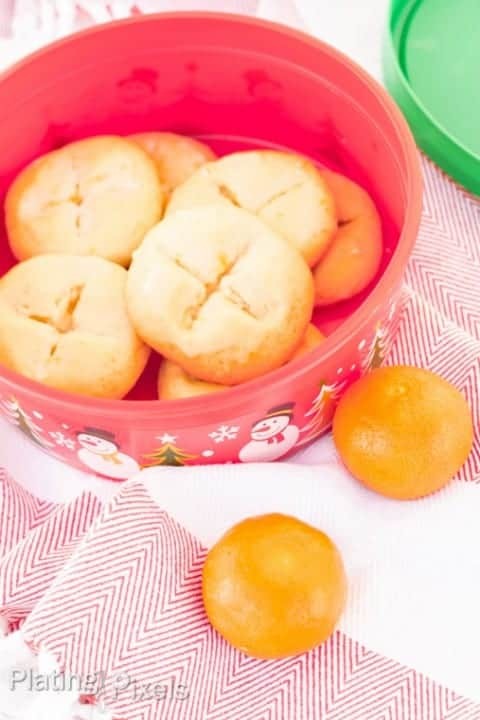 Then top these Christmas cookies with a powdered sugar and fresh tangerine juice glaze. This recipe is truly special, and I’m so happy to share it with fellow food bloggers and all of you, while helping Kids with Cancer. Citrus zest goes a long way to add flavor in baking. You only need about a tablespoon to flavor an entire batch of cookies. If in a pinch, you can substitute fresh orange zest and squeezed juice for tangerine, but the flavor won’t be as unique. I shot this in natural light at 1/160 sec, f/ 2.8, ISO 400. I photographed this recipe twice, since I wasn’t too happy about how the first shoot turned out. It just didn’t have the right look and mood. With any creative work, I think there’s a fine line between obsessing over small details until it’s perfect in your mind (which it never is by the way) and producing the best work you can at that moment and being happy with it. Be happy with what you create, but if you know you can do better, then give it another shot. I’m happy with the final images with the Christmas containers. It has a whimsical, yet elegant look; perfect for a holiday themed recipe. Check out our Thanksgiving Recipe Roundup: 19 Yummy Desserts and Sides for more Fall and holiday inspired recipes. In a very large bowl, beat softened butter with an electric mixer on medium speed for 30 seconds. Add sugar, baking soda, cream of tartar and salt. Beat on medium until light and fluffy, 2-3 minutes, scraping sides occasionally. Add eggs, tangerine peel, vanilla and almond extract. Beat until combined. Slowly beat in olive oil until combined. Beat in cornmeal. Slowly add flour and beat until smooth and combined. You may need to hand stir in last bit of flour. Cover and refrigerate dough to firm up for handling, about 30 minutes. Preheat oven to 350º F. Shape dough into 1-inch balls, place balls 2 ½ inches apart on a parchment lined baking sheet. Using the cut edge of a knife, press an X into the center of each ball. Don't press down too much as they'll spread out when baking, you just want an imprint on the ball. Bake at 350º for 10-12 minutes, or until the tops are slightly golden brown. 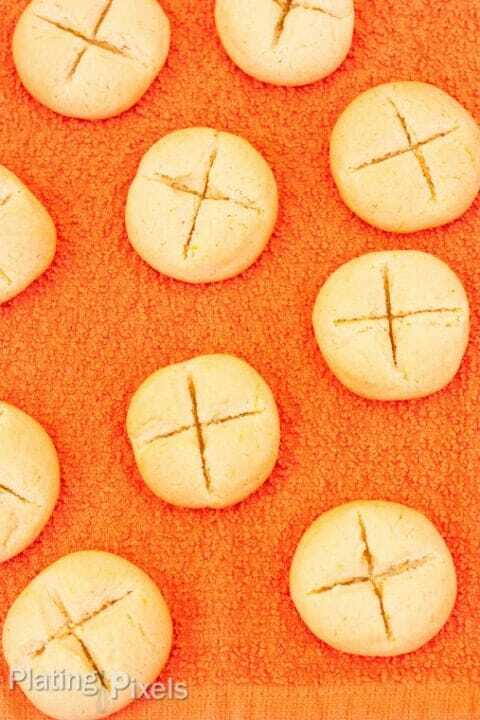 Remove from oven and while cookies are still warm, use the knife to slightly press the X's again (see pictures above). Place on wire rack. 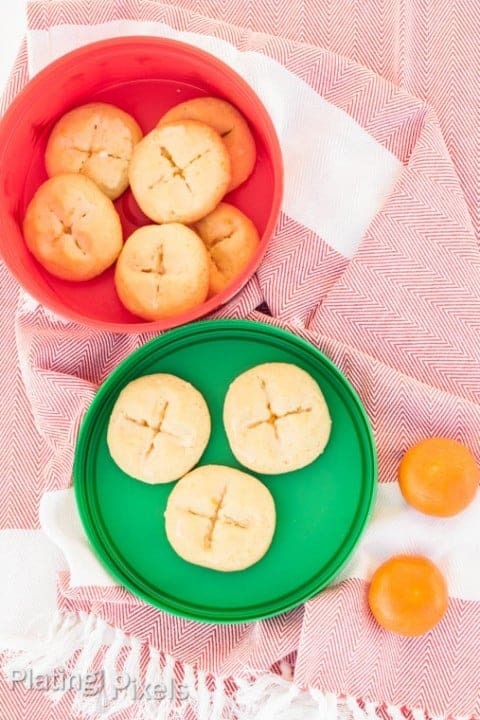 Glaze cookies while they are still warm: In a medium bowl stir together powdered sugar, tangerine juice and water. You may need slightly more or less water depending on constancy. 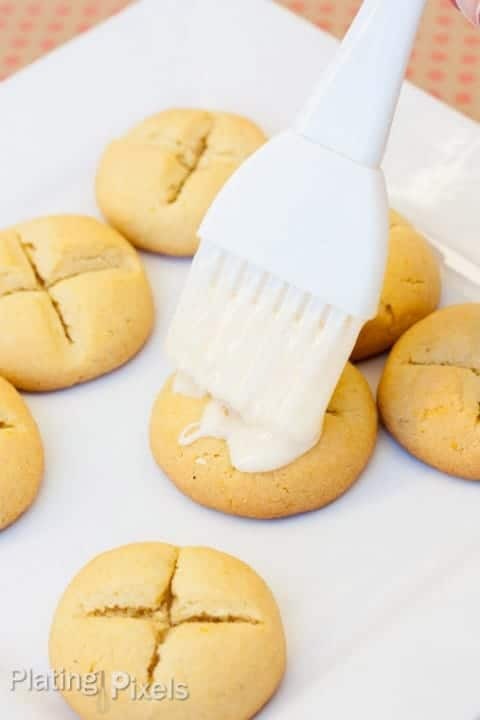 Brush glaze over cookies. Options: Sprinkle tops with almond slices. 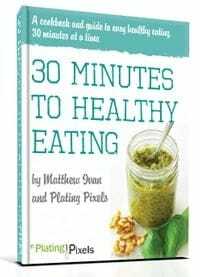 – Recipe inspired by Better Homes and Gardens. Christmas Cookies. Print. 2014. Hi, I found you on Goodreads, thought I would check you out, I love the sound of these cookies, but more than that I love that you are also supporting a charity! I would actually be interested in interviewing you for my website, have a think and let me know, it’s reflectionsfromme.com, I also love how you include not just the food but photography tips. Hi Mackenzie, thanks for commenting and the nice feedback. I checked out your site and love the heavy use of photography, I’ll read through some of the posts more. I’d love to do an interview for you. 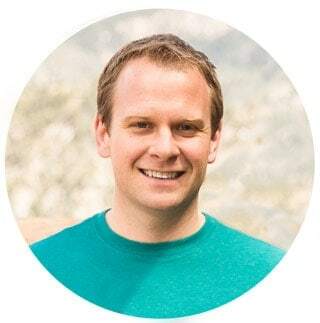 Send me a message through my contact form or email me at ” matt [at] platingpixels [dot] com ” I’ll follow up in a bit if I don’t hear from you. Thanks! It was such a fun surprise to receive your delicious cookies at my office! Glad to be part of the Food Blogger Cookie Sway with you. Nice to also meet another Bay Area Blogger! Thanks Lisa! Glad to be part of the Cookie Swap too and be able to send you these cookies. It’s a newer recipe so glad you liked them. Nice meeting a local blogger as well!